OAKLAND, Calif. -- Stephen Curry's greatness as a basketball player can be measured by his record-setting shooting numbers that are changing the game. His immense popularity derives from something less tangible. While many NBA greats rely on uncommon height and athletic ability that average fans can only dream of having, Curry's game relies on the traits that every casual player can work on: shoot, dribble and pass. The difference is, perhaps nobody ever has put those three skills together the same way Curry has the past year as he has dominated on the court and made the once downtrodden Golden State Warriors the NBA's must-watch team. "The way that I play has a lot of skill but is stuff that if you go to the YMCA or rec leagues or church leagues around the country, everybody wants to shoot, everybody wants to handle the ball, make creative passes and stuff like that," he said. "You can work on that stuff. Not everybody has the vertical, or the physical gifts to be able to go out and do a windmill dunk and stuff like that. I can't even do it." That's about all Curry is unable to do on the basketball court. His amazing year, in which he won an MVP, led Golden State to its first title in 40 years and helped the Warriors get off to a record-setting start this season, earned him The Associated Press 2015 Male Athlete of the Year. Curry finished first in a vote by U.S. editors and news directors, with the results released Saturday. He joined LeBron James, Michael Jordan and Larry Bird as the only basketball players to win the honor in the 85 years of the award. Curry beat out golfer Jordan Spieth, who won two majors, and American Pharoah, who became the first horse since 1978 to win the Triple Crown. 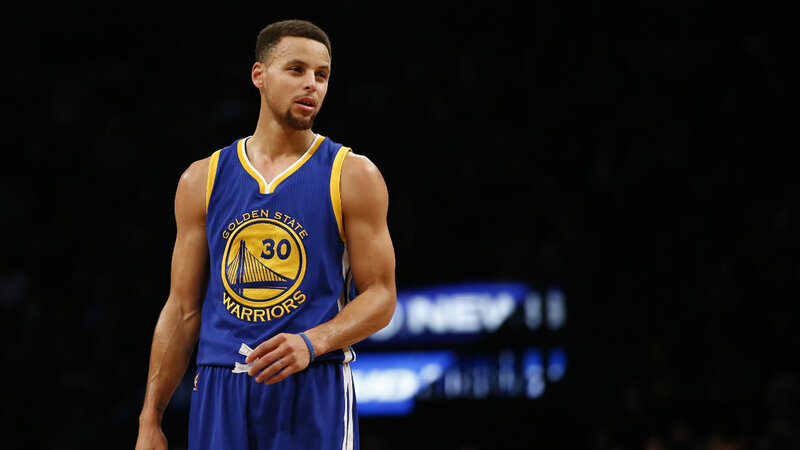 While American Pharoah got three more first-place votes than Curry's 24, Curry appeared on 86 percent of the 82 ballots that ranked the top five candidates. More than one-third of the voters left American Pharoah off their list. "That's a real honor," Curry said. "I'm appreciative of that acknowledgement because it's across all different sports. ... It's pretty cool." Curry has become the face of the NBA this past year. His jersey is the best-seller in the league, his team's games get record television ratings at home and in opposing markets and even his 3-year-old daughter Riley became a star by overshadowing her dad at playoff news conferences. Even his intricate warmup routine has become a show for fans who get out early or even sometimes on TV pregame shows. He does an elaborate two-ball dribbling routine, works on passes and shots with both hands, takes jump shots from just inside half court and then caps it with a long-range shot from the tunnel on the way back to the locker room. "Steph actually looks different," ESPN analyst Jalen Rose said. "Like the best player in the league usually is also physically opposing - 6-6 plus, scowl on his face, menacing. With the attitude that we appreciated because like a Michael Jordan or Shaquille O'Neal, or Kobe Bryant, you know, just a cutthroat nature. Steph allows us into his living room. We see him on a national stage be a son, a dad, a husband, a father, a brother. And he does all of it while continuing to improve." Curry has improved his scoring from 23.8 points per game to 30.8 - the biggest one-year jump ever by an MVP - prompting Rose to say that Curry could be the most improved player and repeat as MVP this season in a remarkable tribute to the offseason work he put in even after winning a title. He has become much more efficient scoring on drives and has amazingly added range to his already record-setting 3-point shooting. Curry can consistently make shots from 28 feet out as he is on pace to shatter his own record of 3-pointers made in a season. The drive to succeed is fueled by the fact that Curry got no major scholarship offers coming out of high school, he was the third point guard taken in the 2009 draft and he settled for a below-market contract extension three years ago because people questioned his durability following ankle injuries. "The thing I would say about Steph, what makes him who he is, is that nobody has to challenge him to get to the next level because he does it on his own," coach Steve Kerr said. "I didn't think he could get that much better from last year but I do think he's gotten considerably better, which is quite a feat when you're the reigning MVP."